The so called "accommodation" offered people of faith by the Obama regime is a distinction without a difference. It is a cynical effort to defuse growing national resistance with semantic window-dressing. Saying that insurance companies will be mandated to provide abortifacients and contraceptives as part of the insurance packages all employers will have to chose from, makes no ethical difference. As president of the US Conference of Catholic Bishops, Cardinal-designate Timothy Dolan has decided to see the new regulatory mandate before judging it. 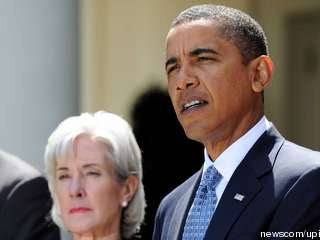 However, on the basis of what Obama and the vengeful, excommunicated Catholic, Kathleen Sebelius, have had to say about it, it should be met with rejection and renewed determination to oppose the Obama regime's trampling of conscience rights and religious liberty. We would suggest to the American Catholic bishops that they need to stand up for the conscience rights of all Americans, not merely their own institutions. No insurance company, employer or individual should be compelled by their government to purchase or do anything in violation of their conscience. Obamacare is a carefully calculated path to an oppressive, jack-booted, police state. It must be repealed root and stem. The Obama-Sebelius trampling of religious liberty offers patriots an opportunity to defend our country in a dark hour, restore Constitutional government and ensure that we never again raise up to the highest office in the land an enemy of God-given rights.